Preheat oven to 350F and spray a 9-inch springform pan with cooking spray. Note – I wouldn’t use a 9-inch round pie dish because I think it will be slightly too shallow; a 9-inch square pan may work but I prefer the ease and cosmetic result of a springform pan. To the canister of a food processor, add the graham crackers, almonds, and process on high speed until broken down into fine crumbs, about 1 minute. Tips – I used Honey Maid Chocolate Graham Crackers and in a standard box there are three packets of 9 crackers each. Before adding the graham crackers to the food processor I beat the sealed packet a few times with the back of a table knife to break up the crackers and help the food processor along. Add the butter and process on high speed until incorporated and crumbs are well-moistened, about 1 minute. Turn mixture out into prepared pan and hard-pack with the back of a spatula to form an even, smooth, flat crust layer. Bake for 12 minutes. Allow to cool on a rack for about 15 minutes before adding the filling. After crust has cooled, to a medium bowl add the chocolate chips; set aside. To a 2-cup glass measuring cup or microwave-safe bowl, add the cream, honey, and heat for 1 minute on high power. Stop, whisk to combine, return measuring cup to microwave, and heat for 45 to 60 seconds, or just under a boil; keep a close eye on it since all microwaves vary and you don’t want it to boil. Whisk briefly to combine. Pour cream-honey mixture over chocolate chips and whisk until silky smooth and combined. 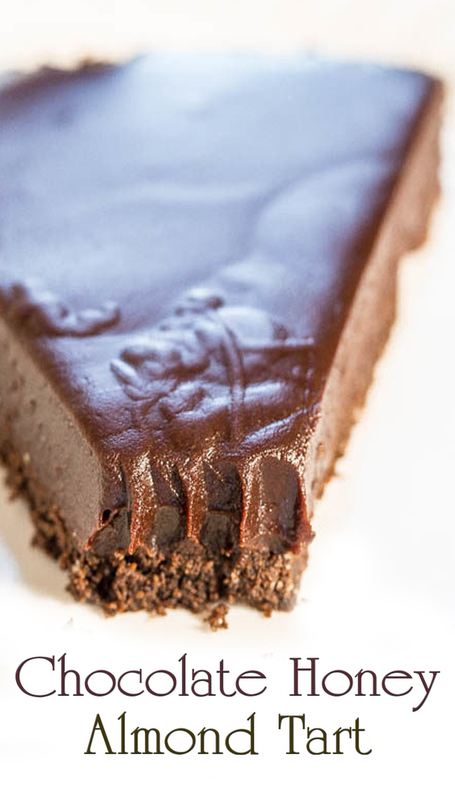 Pour chocolate mixture over the crust, smooth the top lightly with a spatula or offset knife, cover pan with plasticwrap, and place pan in fridge for at least 5 hours to set (overnight is recommened) before removing from springform pan and slicing and serving.